1. Newborns have their pictures all over social media, within hours, sometimes minutes, of their birth. Adopted children need a much higher level of security. Whilst we hope that our adopted children will enjoy a positive relationship with their birth family one day, this has to be done in a safe way, through the professional agencies involved – we want to minimise the risk of birth family searching and finding the children in an unsafe way. If you think I’m over-reacting, you could read this harrowing article, published by The Guardian in May 2015. 2. Newborns are spoilt by visitors. 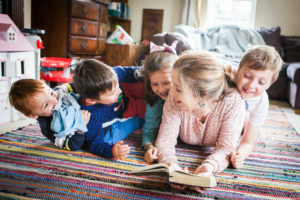 Adopted children need to be very carefully settled into their new ‘forever home’ before visitors are allowed. They also need to time to switch attachment from their foster carer to their new adoptive parents – this is a significant event in the life of any adopted child and no, it doesn’t make much difference how old the child is. Sure, a child adopted when younger will have fewer/no memories of their past life – but that doesn’t mean they haven’t attached to the one who has been feeding them, changing their nappies, putting them to bed, comforting them, getting them dressed, playing with them, and all the other countless ‘tasks’ which, to even the youngest baby, mean ‘love’. So, this awareness of who loves them, who is taking care of them, who is keeping them safe, needs to shift securely to the adoptive parents before other significant people are introduced. 3. Newborns get cuddled by everyone. 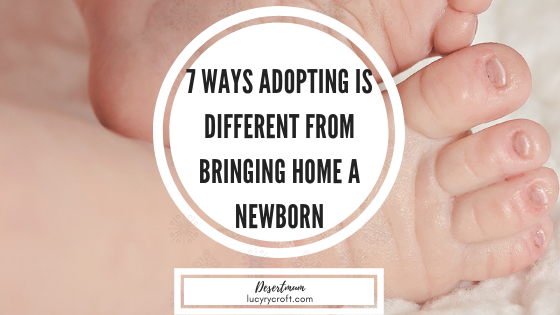 Like the above point, for the first few weeks/months, all the main care-giving tasks (including lifting, carrying, cuddling) are supposed to be done by the adoptive parents. How else will the children learn to feel safe in their care? You don’t need to be quite so careful with a newborn, as he will have been developing an attachment to his parents in the womb: through hearing their voices, and living inside Mum. There will be plenty of opportunities for his parents to bond with him in the early weeks through feeding, sleeping (or lack of) and general caring. This is what we’ll need to do with our adopted children, even though their age might indicate that anyone can carry out these tasks for them. 4. Newborns are portable: you can pretty much take them anywhere, and make them fit into your life. Again, adoptive parents need to be very careful with adopted children, making sure that they don’t take them anywhere which could be unsettling or confusing. Imagine what will happen when we eventually pitch up at the school gate with our new offspring – friends will flock round like pigeons. From an adopted child’s point of view, suddenly there are too many people you don’t recognise, all getting way too close (are they about to become my new mummy or daddy?). 5. People want to ask questions about newborns – and parents are happy to talk. There are lots of things we can tell you about our adopted children. Lots of things we will love to say. But other things that we just can’t. Their early life history, their birth family, and the circumstances which led to them going into care are not things that we will be sharing with anyone other than them, and the harrowing details will be left until they’re old enough to take them. It’s their story, and they may choose to share it with you when they’re older. But, for now, please don’t ask about their pasts. Why not ask about the present, or the future? 7. Newborns meet you at your least attractive. The other day, I started wondering what I’d wear on the day we meet our adopted children. I’m not a dressy sort of person, but I do try to make an effort when meeting new people, and the fact that we’re likely to have 45 glorious minutes of child-free time before we have to leave means that that effort is more likely to happen. But then I remembered how un-made-up I was when I met my birth children. Wet hair, years-old nightshirt, unshaved legs. Yeah, really attractive. They didn’t seem to care, though, and I’m pretty sure neither will our adopted children. But at least it’s nice to have the option of looking OK.